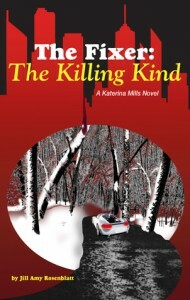 Katerina Mills is a fixer. What is a fixer? Well if someone has a problem and are wealthy, Katerina gets assigned and can use the contacts she has to fix the problem, collect the money etc. Simple right? Well nothing is ever easy and simple and Katerina finds that out when she is assigned to several 'problems'. If it wasn't for the fact that she has some debt to pay off and as a college student, that can be difficult to do. So solving this problem like I said should be a breeze. The problem is she is involved in several different problems that seem to not go as planned. This novel is definitely character driven with a plot that is different than I have read before. At times a madcap journey with different characters, a cop who she has a non relationship with, another man that she really likes but doesn't want to get to close to and then there are the clients, and their exes. Among the many people there are men who are not very nice and will do whatever it takes to get what they want from Katerina. I have only read this the third book in the series, I really want to read the first two now, but this series is definitely one that is a fast paced page turner. I did get confused at times in trying to keep up with Katerina, but that added to the excitement of the story. If you want a fun series to read, this is it.